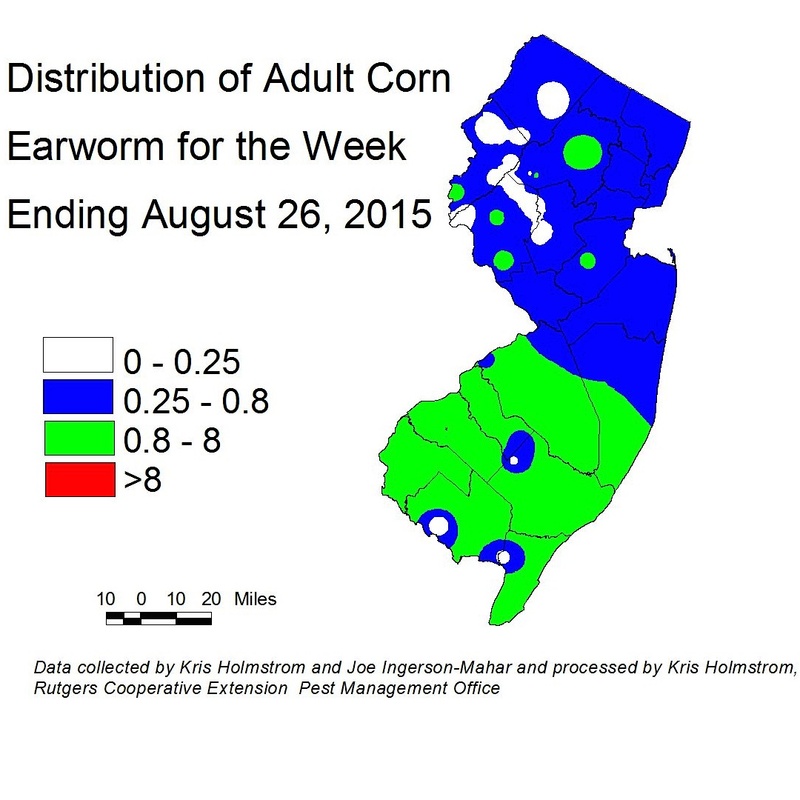 European corn borer (ECB) adult catches have become somewhat more consistent in southern NJ over the past week, but with very few individuals captured north of Burlington County (see ECB map). This late summer flight appears to be a fairly week one. As always, consider treating when the number of infested plants in a 50 plant sample exceeds 12%. Any planting remaining at or above threshold as it proceeds to full tassel should be treated, as this is the last stage at which ECB larvae will be exposed and vulnerable to insecticidal sprays. Corn earworm moths (CEW) activity continues to increase, with consistent catches now occurring in the northern third of the state (see CEW Map). Trap catches to our south still offer little indication that there is a large-scale influx of moths headed for NJ at this time. As always, we will monitor our populations and report immediately should such an event occur. CEW moth catches in the limited CEW pheromone trap network in the southern counties have stabilized over the past week, with high catches remaining in Cape May and parts of Salem and Camden counties. Overall activity is more consistent throughout the south, resulting in a broad area where a 3-4 day silk spray schedule (green area) is recommended (see CEW pheromone map). The somewhat more conservative scale of the pheromone map indicates a 2-day schedule (red areas) in coastal south Jersey, although this is not supported by blacklight trap catches in the same areas. 3-day schedules are warranted throughout southern NJ at this time. 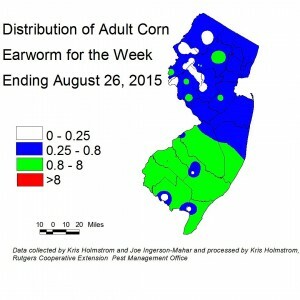 Fall armyworm continues to be a threat to sweet corn. This pest can be devastating to small corn plants. Fields down to seedling stage should be scouted weekly for signs of infestation. FAW do not respond well to pyrethroid insecticides. The most useful products are those in the IRAC group 28 class (Coragen, Exirel, Belt) or the IRAC group 5 class (Radiant, Entrust), or combination products including these classes. See the 2015 Commercial Vegetable Recommendations Guide for insecticides effective against FAW. Despite low numbers of ECB throughout the state, the threat to peppers from this pest remains. Infestations have declined dramatically over the past 10 years, but today Dr. George Hamilton and George Condon report an infestation of approximately 5% in pepper fruit at the Snyder Research Farm in Hunterdon County. As ECB adults reach a level of 1/night in local blacklight traps, insecticide applications may be warranted to limit damage. In addition to effective insecticide sprays (these include IRAC grp. 5 materials like Radiant and Entrust, as well as grp. 28 materials like Coragen and Synapse), Coragen and Verimark (grp. 28) may be used via the drip irrigation to provide longer-term systemic control of fruit infesting ECB larvae. 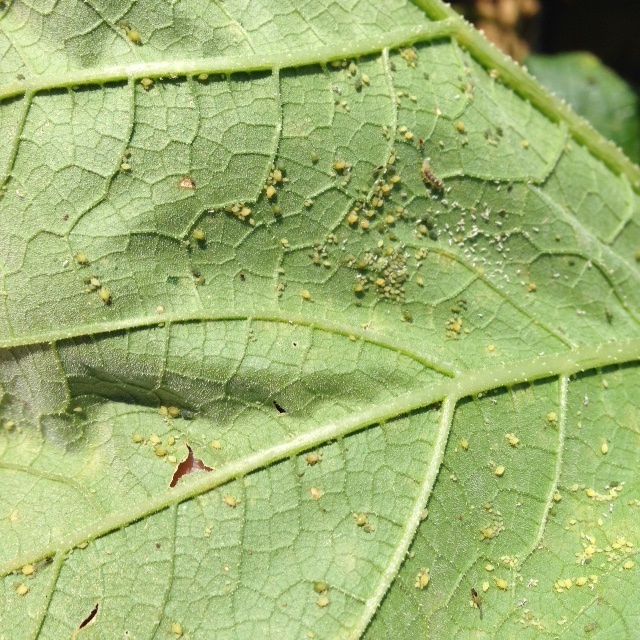 Recently, IPM scouts have discovered early signs of anthracnose infections in pepper fields. Pepper anthracnose is a potentially devastating disease, as spores spread via wind and splashing from lesions (see photo) onto other fruit. 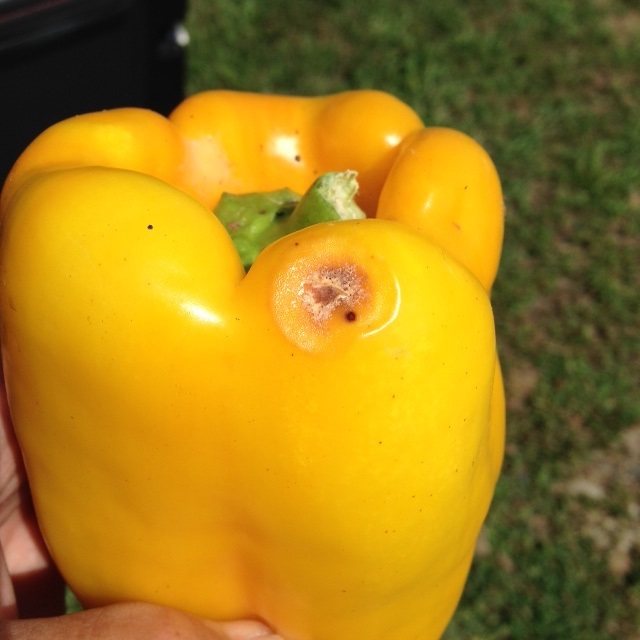 Unlike tomato anthracnose, pepper symptoms often develop on immature and mature fruit. If this disease if discovered in the field, it is important that symptomatic fruit be removed promptly from the area. 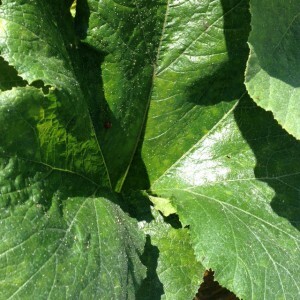 An insecticide program including a rotation of chlorothalonil and a labeled FRAC group 11 fungicide should be initiated immediately. See the 2015 Commercial Vegetable Recommendations Guide for fungicides effective against pepper anthracnose. Coming into the end of August we have passed the point when most of the weevil populations are typically discovered. So far as known there are no infested pepper fields at this time. Weevils trapped after September 15 will be of little concern. 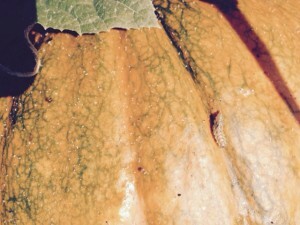 3) sticky droppings on the surface of a pumpkin fruit with cast aphid skins adhering to the fruit. Note the predatory syrphid maggot on the fruit. If the presence of aphid droppings on the fruit is economically disadvantageous, growers should consider an application of an insecticide that specifically targets aphids to manage the population. This may be particularly important in fields to be opened to the public for u-pick. Avoid synthetic pyrethroid insecticides, as these will destroy predator populations, while doing little to manage aphids. 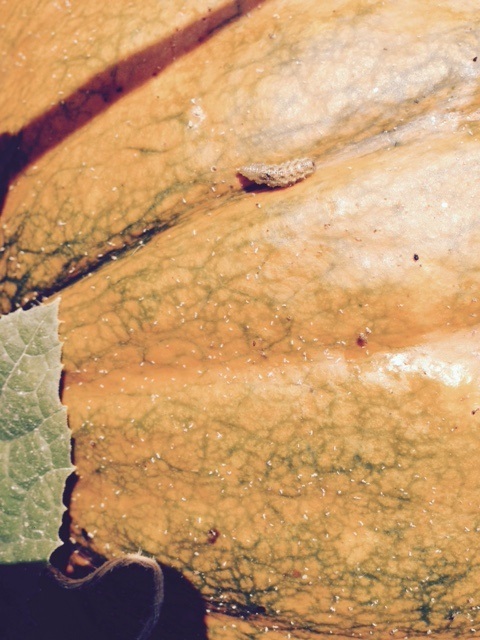 Consult 2015 Commercial Vegetable Recommendations Guide for insecticides that target melon aphid on pumpkins.